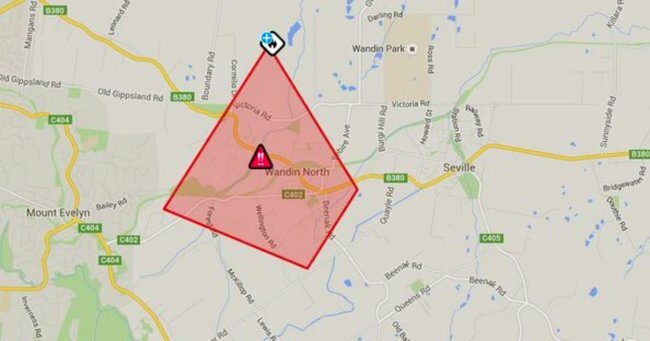 BREAKING: Emergency warning issued for Wandin, VIC. BREAKING: Emergency fire warning issued for Victoria. UPDATE: Emergency services have downgraded the warning for Wandin from emergency to watch & cct, while Wonthaggi has been issued an emergency warning. Severe thunderstorms are also posing a threat of 100kmh/hr wind gusts in the Melbourne metropolitan area. The Country Fire Authority has issued an emergency bushfire warning for Wandin, Victoria. There is a fast moving, out of control grassfire traveling in a southerly direction from Rodger Road, Wandin North towards Warburton highway. Authorities have advised that it is too late to leave. The safest option is to take shelter indoors immediately. Victoria Emergency have instructed residents to close all exterior doors, windows and vents and turn off cooling systems. Residents should take shelter in a room that has a door and or a window to the outside as it is critical to keep an eye on what is happening with the fire. If you are travelling, do not enter the area, U-turn to safety. Mamamia will update this page with more information as it becomes available.